To celebrate the 25th Anniversary of the Morton’s Steakhouse Group, they sought a thoughtful, bespoke gift for VIP guests. Primarily, Morton’s wanted to honor their most loyal guests. Silver color to represent the 25th anniversary of the group. The choice of wine accessories reflected their customers joy of food and wine, and was keeping with the restaurant theme. The packaging gave us an opportunity to tell the Morton’s story and again thank the VIPs for their continued loyalty. 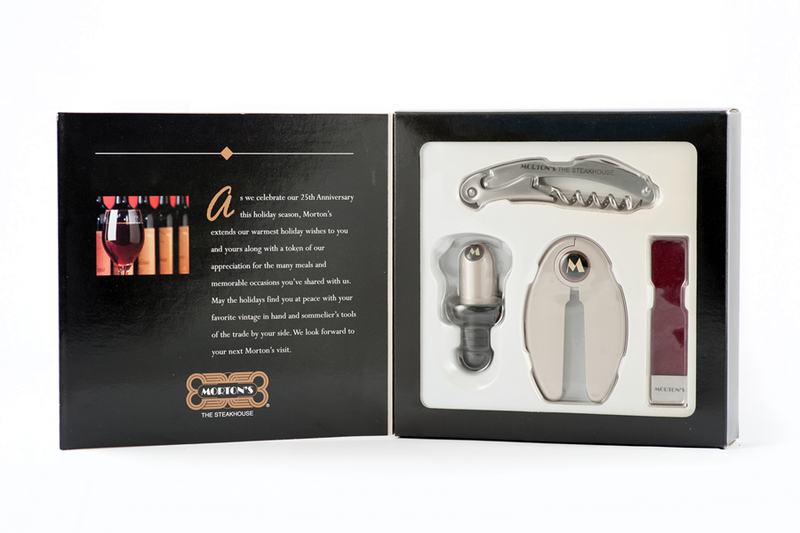 On the occasion of the celebration of the Morton’s Steakhouse Group 25th Anniversary, the VIP guests were presented with a collection of gifts, including a wine bottle opener and stopper, foil cutters, and drip stoppers. The entire gift was only $6.50 per VIP!